Do five activities within your home or school that require the use of mathematics. Explain to your den how you used everyday math. Keep track of the money you earn and spend for three weeks. Measure five items using both metric and nonmetric measures. Find out about the history of the metric system of measurement. Geometry is related to measurement but also deals with objects and positions in space. Many objects can be recognized by their distinctive shapes: a tree, a piece of broccoli, a violin. Collect 12 items that can be recognized, classified, and labeled by their distinctive shape or outline. Select a single shape or figure. Observe the world around you for at least a week and keep a record of where you see this shape or figure and how it is used. Study geometry in architecture by exploring your neighborhood or community. Look at different types of buildings-houses, places of worship, businesses, etc.-and create a presentation (a set of photographs, a collage of pictures from newspapers and magazines, a model) that you can share with your den or pack to show what you have seen and learned about shapes in architecture. Calculating is adding, subtracting, multiplying, and dividing numbers. Learn how an abacus or slide rule works and teach it to a friend or to your den or pack. Go shopping with your parent or adult partner and use a calculator to add up how much the items you buy will cost. See whether your total equals the total at check out. Visit a bank and have someone there explain to you about how interest works. Use the current interest rate and calculate how much interest different sums of money will earn. Statistics is collecting and organizing numerical information and studying patterns. Explain the meaning of these statistical words and tools: data, averaging, tally marks, bar graph, line graph, pie chart, and percentage. Conduct an opinion survey through which you collect data to answer a question, and then show your results with a chart or graph. 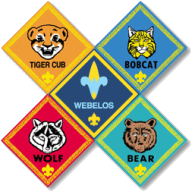 For instance: What is the favorite food of the Cub Scouts in your pack (chart how many like pizza, how many like hamburgers, etc.). Study a city newspaper to find as many examples as you can of statistical information. Learn to use a computer spreadsheet. Probability helps us know the chance or likelihood of something happening. Explain to your den how a meteorologist or insurance company (or someone else) might use the mathematics of probability to predict what might happen in the future (i.e., the chance that it might rain, or the chance that someone might be in a car accident). Conduct and keep a record of a coin toss probability experiment. Guess the probability of your sneaker landing on its bottom, top, or side, and then ffip it 100 times to find out which way it lands. Use this probability to predict how a friend's sneaker will land. Measuring is using a unit to express how long or how big something is, or how much of it there is. Interview four adults in different occupations to see how they use measurement in their jobs. Measure how tall someone is. Have them measure you. Measure how you use your time by keeping a diary or log of what you do for a week. Then make a chart or graph to display how you spend your time. Measure, mix, and cook at least two recipes. Share your snacks with family, friends, or your den.